Gravity Club owners Fitness First, which is one of the largest fitness brands in the world and the largest in Southeast Asia, worked with Illuminate Lighting Design to create an atmosphere where lighting helps define the club’s sophisticated brand and style, and enhance the members’ experience. Designers at Illuminate Lighting Design chose Soraa’s LEDs for their colour temperature, high output, multiple beam options, and dimmability. 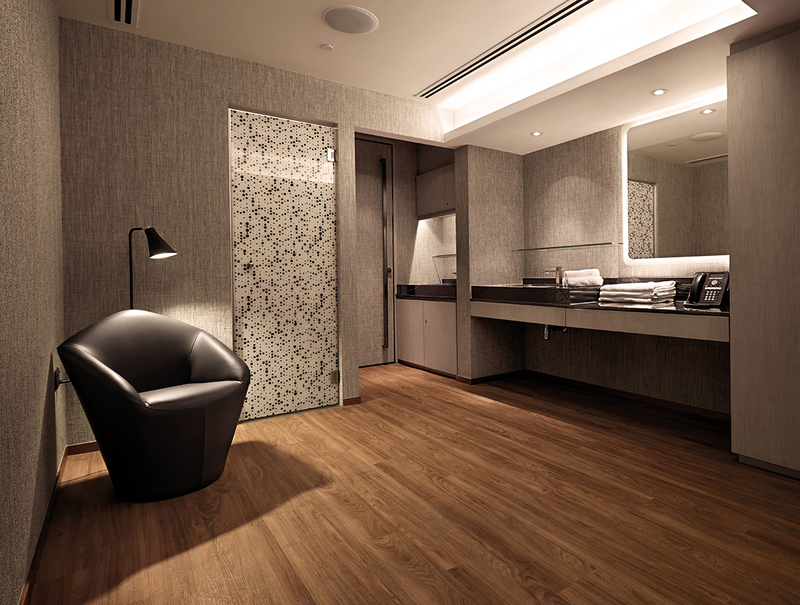 “Soraa’s LED lamps perfectly illuminate the Gravity Club. Lighting is at the heart of creating an environment that combines upscale exercise facilities with beautifully designed social and business spaces in a single premium location. The successful integration of lighting as part of Gravity Club’s holistic experience was the result of a fresh approach to lighting schemes that are rarely offered in a gym,” said Claire Riley of Illuminate Lighting Design. Specifically, the club chose Soraa’s LED lamps for all its downlighting needs, as well as for spotlights throughout the space. In the social spaces of the Gravity Club, such as the lounge, there is a warmer colour temperature to create a calming ambiance for members to wind down. The colour temperature then gradually increases towards the work-out area to aid high-performance activities. In the changing rooms, the company’s LED lamps are positioned precisely at alternating locker lines to emphasis the linear interior design. Soraa’s unique GaN on GaN™ LED technology allows its LEDs to operate at currents that are more than five times higher than other LED lamps, resulting in a narrow beam that can be controlled to illuminate any area with a single crisp shadow. Colours and whites in distinct spaces throughout the Gravity Club are perfect rendered by Soraa’s Violet-Emission 3-Phosphor (VP₃) LED technology. Utilising every colour in the rainbow, especially deep red emission, Soraa’s LED lamps render warm tones beautifully and accurately, and achieve a colour-rendering index (CRI) of 95 and deep red (R9) rendering of 95. And unlike blue-based white LEDs without any violet emission, the company’s lamps have violet emissions to properly excite fluorescing brightening agents, including paper and natural objects like human eyes and teeth. For more information on Illuminate Lighting Design, please visit www.illuminateld.com.